i open the window, let the sky in. Subterranean Blue Poetry Presents! A Poetry Contest and Submission Call for an Anthology, The Children of Orpheus. In ancient Greek mythos, Orpheus is a mystical figure, an Oracle, a prophet, musician and Poet. His music is magical, giving him the gift of enchantment. His wife Eurydice is attacked by a satyr, falls into a pit of snakes and is fatally bitten on her heel. Orpheus discovers her dead body, and overcome by grief plays the lyre and sings so that everyone, all the gods and nymphs weep. He travels to the underworld and plays and sings for Hades and Persephone, so moved they allow Eurydice to return to the upper world with him, with the one condition that he walk in front of her and not look back. He reaches the upper world and in anxiety he turns to see if she is there and she vanishes, this time forever. The idea of rescue and the healing power of love like an elixir in an ornate golden cup attracts many contestants. The Holy Grail, the search for Guinnevere, the perfect lover is fraught with pitfalls and mishaps, it is important to have an understanding of culture/politics and the Holy Spirit Way. Some of the greatest love poetry is written in war zones and mental institutions. Some love affairs are never requited, some love affairs are requited but can’t last, some love affairs were never meant to be, some love affairs were meant to be but never happen, some love affairs are happy. Rescue, rescue missions, freeing the dove in the gilded cage, what came to be. The theme of The Children of Orpheus is love in the first degree. Imagist, Symbolist, Haiku and New Age synergies in love, the best love poem any genre. Love in the shadows, impossible love, bite love, unrequited love, memories of love, dreams of love, fulfilled love, on a cloud love poems . . . how i placed a picture of my last lost lover on a poster and pinned it up on bulletin boards, polls, milk cartons as if looking for a lost cat, all the stories of love. The winner of the Best Love Poem receives a bottle of champagne and 2 wine flutes (i include the wine flutes in case you are incarcerated and do not have access to suitable tableware). The Winner of The Children of Orpheus Anthology/Contest is Adrian Ernesto Cepeda for We could've painted skies blue. 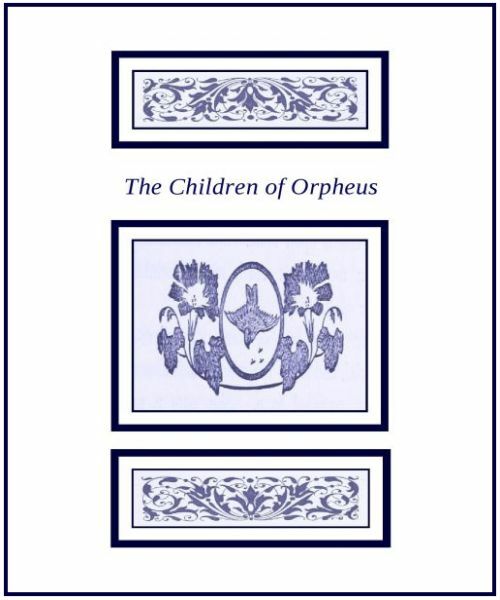 The winner and runners up have won a place in The Children of Orpheus Anthology published by Subterranean Blue Poetry. The Anthology is available for purchase at Amazon Station. Proceeds from the Anthology sale will be donated to the Chez Doris Drop-In Centre for Women in Montreal. Thank you to all Contributors and Readers of The Children of Orpheus Anthology. Available @ Amazon Canada. www.amazon.ca. Available @ Amazon United States. www.amazon.com. Available @ Amazon United Kingdom. www.amazon.co.uk.